The success of this underdog comedy from director Michael Ritchie almost single-handedly spawned the kids’ sports film boom of the 1980s and 90′s. When beer-breathed ex-minor-league ball player and professional pool cleaner Walter Matthau agrees to coach a Los Angeles little league team, he soon finds he’s in over his head, having inherited an assortment of pint-sized peons and talentless losers. They play well-organized teams and lose by tremendous margins, and the parents threaten to disband the Bears to save the kids (and themselves) any further embarrassment. Matthau refuses, though, and brings in a pair of ringers: Amanda (Tatum O’Neal), his ex-girlfriend’s tomboy daughter, and Kelly (Jackie Earle Haley), a cigarette-smoking delinquent who happens to be a gifted athlete. With their help, the Bears manage to change their losing ways and qualify for the championship, where they face their arch-rivals. I played a lot of youth sports as a kid: basketball, little league, tennis, softball, etc. From 1985-1992 i played in thousands of games, tournaments, matches, scrimmages, practices etc. I was never the star player on the team, but never the worst either. Always, i was the mediocre athlete, fiercely competitive and who played his heart out. I remember in 4th grade i was in the unique position of attending a school where there were no 5th grade boys. In order for the school to field a 5th grade basketball team they had to use us, the 4th graders. So basically we were 4th graders playing in the 5th grade basketball league. Well we were all excited when we finally got to play our first game, and i’ll never forget what happened when we showed up. The other team was older and twice our size and once they saw us outside the locker room, they started celebrating, screaming and high fiving each other, taunting us, as they knew we would obviously be no match for them. It was depressing and humiliating, but it was infuriating as well. We wanted badly to win and we played with everything we had and we beat them 18-16. The looks on the other teams’ faces after the game was a mix of shame and utter disbelief. As 4th grade kids in a 5th grade league, we went on that year to take 2nd place in the division(the team that took first really did deserve it as they were the best team and simply unbeatable). All of my experiences in youth sports over the years led me to appreciate what an amazing film “The Bad News Bears” is. It captures so perfectly the essence of the politics, competition and emotions that go along with childhood athletics. A movie like “The Bad News Bears” could never be made in today’s politically correct society. 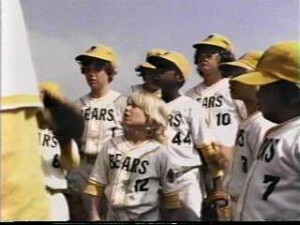 Unlike the watered down, “Zoog Disney” kids culture of today, “Bad News Bears” shows kids as they really are. Awkward, self conscious, cruel and nasty. Do you think quotes like the following would have made the cut in modern kids films? that by doing everything right, by putting your heart and soul into something that means so much to you and giving it your all, you still may not get the girl, you still are not guaranteed victory just by virtue of hopeful romanticism and having a heart of gold. So many modern films sellout on this point in order to score a cheap fairy tale ending. That’s precisely what makes “Bad News Bears” such a moving story of redemption, because it brings out the feeling of success against overwhelming odds, but also captures the heartbreak of working so hard and coming so close only to come up short with a lousy second place trophy in the end. Yet we remain hopeful romantics in spite of knowing the eventual outcome of all our efforts will probably just be a huge disappointment. “Just wait ’til next year”.